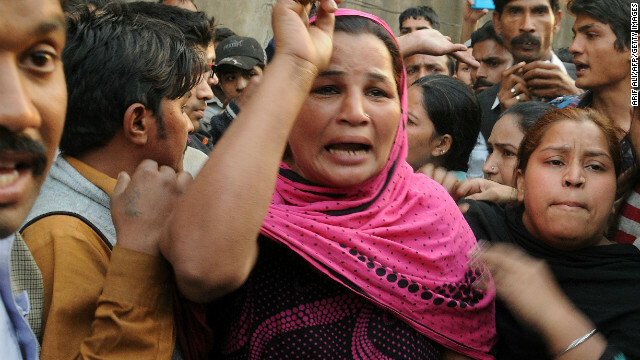 Pakistani Christians react after Muslim demonstrators destroyed the homes of members of the Christian community. Islamabad, Pakistan (CNN) - Outraged Pakistani Christians took to the streets of Lahore on Sunday, protesting a rash of violence against their community over the weekend. Demonstrators denounced the burning of more than 100 homes of Christians on Saturday - a spree spurred by allegations that a Christian man made remarks against the Muslim prophet Mohammed. HAPPY EASTER EVERYONE!!! Thank you, thank you, thank you, Pakistan. Pakistan will rise above its rivals by killing Christians, by looting Christians, and by burning churches. God speed. Pakistanis are Islamists who loot and kill Christians. Religion. Always a bad idea. You forgot that I indicated that I am a deist which you kindly tried to define for me, quite badly, BTW. "Why are we so hated for not wanting someone to burn in a lake of fire for eternity." "as I said, @Chuckles, and @JMEF are two examples." Well, I'll let them determine whether they actually fit into your specific definition or not. "any atheist that considers the multi-verse a real possibility, but the God of Israel not." So some hypothetical atheist that fits this definition that you specified? So, to which atheist were you referring, exactly? "There is no compelling need for a supernatural being or prime mover to start the universe off." How is it possible that a person can accept or reject another persons idea, freewill. Join the flat earth society Chad, you belong there. His head might be flat TOO ! Like to easy for him ......................gravity wins splat goes a bug with out wings. How is it possible to for an atheist to embrace the notion of multiple universes, yet reject outright the possible existence of the God of Israel? Background: To address the impossibility of matter/energy having created itself, the multiple universe (multi-verse) theory on the origin of our universe has been put forth. This is the idea that all the matter/energy in our current universe came from another "pre-existent" universe. Irreconcilability: The notion of a multi-verse is as equally non-scientific as the notion of the God of Israel. Conclusion: atheists that embrace the notion of a multi-verse have no possible basis for rejecting the possible existence of the God of Israel. Nonsense. Merely because you say a theory is implausible, it does not follow that the existence of the God of Israel has to be included in the pool of possible *scientific* explanations. I dont claim the multi-verse is implausible. I merely note that since the multi-verse is not scientifically verifiable, it is irrational to accept the possibility of it while simultaneously rejecting the notion of the God of Israel. It is not irrational whatsoever. When science posits a possibility, while admitting that they really *don't know*, that in no way opens the door for the existence of the God of Israel, or any other. "Surprisingly, observational tests of the multiverse picture may in fact be possible. Anthony Aguirre, Matt Johnson, Matt Kleban and others have pointed out that a collision of our expanding bubble with another bubble in the multiverse would produce an imprint in the cosmic background radiation—a round spot of higher or lower radiation intensity. A detection of such a spot with the predicted intensity profile would provide direct evidence for the existence of other bubble universes. " "How is it possible to for an atheist to embrace the notion of multiple universes, yet reject outright the possible existence of the God of Israel?" Depends on whose idea you want to listen too. Dr. Smolyaninov has created a multiverse in the lab. Search for the info yourself. @Chad ""How is it possible to for an atheist to embrace the notion of multiple universes, yet reject outright the possible existence of the God of Israel?" @chad "how do you figure? Are you claiming that no atheists accept the multiverse?? or that they reject outright the possible existence of the God of Israel?? He isnt actually creating another universe, he is sorta-kinda "simulating" the behavior of light particles in different universes. 1) I'm not sure anyone "embrace[s] the notion of multiple universes"
2) atheist do not, by many definitions of the term, "reject outright the possible existence of the God of Israel?" a) many may consider a mulitverse possible and a valid hypothesis, but I doubt many would consider it "true" at this point. b) many may lack a belief in gods or God, due to a lack of evidence, but don't reject 'any possibility' of such a being. While you may be able to find such a person as you describe, it does not represent a standard "atheist" position. Creating a position and ascribing it to your opponent in order to refute it is the essence of a strawman argument. Perhaps, but can I not twist the information to suit my delusion, after all you do it all the time, see my Paul Davies post above. A. I dont say that all atheists ascribe to the multi-verse, nor that they all reject outright the possibility of God. B. What I did say was "How is it possible to for an atheist to embrace the notion of multiple universes, yet reject outright the possible existence of the God of Israel?". This indeed is a stance that many atheists embrace. They view the multi-verse as a possibility, but the existence of the God of Israel an impossibility. @Chuckles and @JMEF are but two examples. I guess you must have missed my response to you on the previous page. The multiverse has lots of credible scientific support, some even from the article you yourself quoted. Perhaps the most unsettling and far-reaching prediction of string theory – and also of the inflationary universe model – is that the universe we live in is probably not unique. The inflationary model predicts that Big Bangs are continually taking place in other regions of space – and string theory suggests that these other mini-verses may be so different from our own that even the laws of nature and the number of dimensions of space may be different. This notion – that the universe as whole may not look like the part we live in – may help explain a puzzling mystery about our own universe: Why are the constants and laws of nature just so, and not different? For example, why is the speed of light not faster than it is? Why are electrons so much lighter than the protons they orbit in atoms? What we do know is that if these fundamental laws and constants were even slightly different from what is observed, then life as we know it would not exist. (For example, atoms would be less stable, or stars and planets would not form.) Traditionally, physicists have sought some logical explanation for why the universe is as it is. But the likelihood of multiple universes raises the possibility that nature is merely playing dice: some universes have the right conditions for life, while others – the vast majority – do not. The multiverse is an intriguing possibility for scientists because it would answer quite a few questions about the universe as a whole should it prove correct, whereas the idea of a creator being responsible only rises more questions, like how could such a being accomplish this, where did this being exist prior to creating the universe, how did it come into being and others that the main proponents of this idea insist cannot be subject to scientific inquiry. That's why people who actually are interested in the scientific investigation into the origins and structure of the universe are far more interested in the idea of a multiverse than that of a creator. Chad, once again you put words in the mouth of someone you are debating. It may seem a minor point, but where is the supposed "apology" from ME ll ? it would be interesting to know what aspect of my theistic belief you feel is somehow refuted by the HB work? I suspect you have no idea at all, you just put it out there as if I somehow dont believe it (which, of course, I do). But who cares Chad? Since you were not replying to anyone, why set up such a case? Are you sure Chuckles & JMEFsaid G of I is an impossibility? Do you have any evidence that "many atheists" embrace that stance as you worded it? Also, initially you said "embrace the notion" of multi-verse. Now you're saying "They view the multi-verse as a possibility". Which are you saying? And if you're saying the former, exactly what do you mean by "embrace the notion", because it sounds like you're implying some kind of belief of 'faith in' with those words. "How is it possible to for an atheist"
"an atheist" implies a generic atheist. "for the atheists, JMEF and Chuckles" specifies certian ones, (whether the acutally do is another question). I accept your apology for being presumptuous and using a childish, arrogant, and condesceding " 🙂 ". ^ That was meant for @Chad, of course. I would not reject the possibility of God outright either, but I am highly skeptical based on the lack of scientific evidence for this idea. The more we learn about the universe the less the idea of God being active in it seems likely because we don't see where, or how he could be active. Of course, it is possible that some powerful being may show up one day claiming to be God and the creator of the universe, but why would we just trust this claim? Some super-powered Raven, Coyote, or other being claiming to be Zeus, Horus, Odin, or some other god or goddess could make the same claim, right? Aliens could come here today in their flying saucers and claim to have seeded life here too, but I wouldn't just take their word on it, would you? The God of Israel is an intriguing possibility for everyone because it would answer quite a few questions about the universe as a whole should it prove correct, whereas the idea of a multi-verse being responsible only rises more questions; though it solves the problem of our universes origin, how do we solve the problem of that universes origin? Dont we really just push the origin problem back a level by believing in a multi-verse? That's why people who actually are interested in the investigation into the origins and structure of the universe are far more interested in the idea of a creator than that of a multiverse.
" That's why people who actually are interested in the investigation into the origins and structure of the universe are far more interested in the idea of a creator than that of a multiverse. " It's easier to "embrace the notion of multiple universes" because that notion can, theoretically, be proven whereas believers seem to insist that God cannot. They will, of course, accept any proof for God, but reject out of hand any proof against. They usually place all of their hopes on God just appearing some day and being obviously all that they claim him to be. Problem with that is that any sufficiently powerful being could just pop out of the blue, make such a claim, and gain many believers, but would that "prove" that he's God? "How is it possible for an atheist" specifically and unarguably asks a question as to how it is possible for an atheist to have that belief. If does not say ""How is it possible that atheists" or ""How is it possible for all atheists"
Your a blast Chad what would the forum do with out you ? Do you know how to use a hammer ? The bible's funny/nasty story too ! "That's why people who actually are interested in the investigation into the origins and structure of the universe are far more interested in the idea of a creator than that of a multiverse." What the...? Shut the front door! "The God of Israel is an intriguing possibility for everyone because it would answer quite a few questions about the universe"
Of course it would. Magic explains everything. It's demonstrating that magic even exists that you never do. The only thing you do is promote arguments from ignorance. I would think that an eternal all powerful intelligent being would raise more questions than a mutliverse, simple from the fact that an intelligent being would seem to be, by definition, more complex and therefore elicit more questions. How are those thigh workouts going for you, Chad? Still a negative thigh gap for Chad-Rachel? Better lose some weight too. How could you "prove" that God is correct? Is there a scientific experiment that you can conduct, or ore you just waiting for some being powerful enough to pass for God to show up and claim that he is? Doesn't God just push back the question of who his parents were, and theirs, and where they all came from? You can take the lazy way out and say that God always was due to some magic, but that isn't really an answer so much as an excuse, right? ME II asked (out of place) "So, to which atheist were you referring, exactly?" Yes – we need some clarification on that. Also, Do you have any evidence that "many atheists" embrace the particular atheist stance as you worded it? Also, initially you said "embrace the notion" of multi-verse. Later you said "They view the multi-verse as a possibility". Which are you saying? @ME II "So, to which atheist were you referring, exactly?" @Chad "any atheist that considers the multi-verse a real possibility, but the God of Israel not. @clarity ""embrace the notion" of multi-verse. Later you said "They view the multi-verse as a possibility""
@Chad "I view those as essentially equivalent statements. consider a possibility vs do not consider as a possibility. Chad(Rachel) is actually very multi-versed, in the personal sense rather than any scientific one. @ME II "So some hypothetical atheist that fits this definition that you specified?" as I said, @Chuckles, and @JMEF are two examples. OK, Chad. I'll assume since you skipped this other question twice that you currently don't have anything to back up the "that many atheists embrace" part. That many atheists can embrace/do-not-reject/consider-as-a-possibility the multi-verse simply can not be argued. It is the #1 posited theory on the origin of the universe by atheists. Right? right. So, are there "many" atheists that reject the possibility of the existence of God. Any atheist that claims that God does not exist, rejects the possibility. now, I'm happy to post "The God of Israel exists" just to show you how many atheists will respond with "you're crazy, no He doesnt"
bait for yourself chad ? my apologies, I didnt realize how difficult a question this would be for you! tell me, do you reject the possibility of the existence of the God of Israel? The problem I'm having with your posts, Chad is that you once again try to lump everything and everyone into some neatly-defined buckets that do not really represent all of the beliefs and thoughts among those with lack of belief out there. You say quite frequently "rejecting the possible existence of the God of Israel." I can only assume that you are trying to lump all the "high" atheists into that bucket. But people's thoughts on these issues are not that simple, IMHO. –One can not hold a belief in God, but might be open to believing God should God make himself present so that there is empirical evidence for such presence. –One can claim that there is no evidence of any gods (and therefore believe that no gods exist), but do not claim that the existence of gods is an impossibility. –One can claim that there is no evidence of any gods, and therefore not have a belief in God or gods, but may allow for the possibility that a god/creative force may have existed. So when you say "atheists that reject the possibility of the existence of God", hopefully you realize that you're not speaking about the "broad"-sense category of atheists. Hopefully when you say that, you realize that, by using the words "possibility"/"impossibility" and "existence" [present tense], you are using terms that together/separately cross boundaries in different ways between differing groups of thought on the matters of creation, G of I, etc. You still haven't answered: a powerful being shows up and claims to be God. Do you trust him, or does he have to provide proof? Can you scientifically determine if he is what he says he is? On the road now, so will check in later. Up to date definition of deism, just for you. Deism is the recognition of a universal creative force greater than that demonstrated by mankind, supported by personal observation of laws and designs in nature and the universe, perpetuated and validated by the innate ability of human reason coupled with the REJECTION of claims by individuals and organized religions of having received special divine revelation. God, maybe, as Vilenkin has opined but could just be explained by reason, logic as in science. I know you will never get it but that is just fine, enjoy your delusion. I think this Chad is a great example of a pseudo-intellect. I see their posts as an attempt to sound smart. That is what a pseudo-intellectual does. They don't really understand something yet they think they do but they're wrong. @JMEF "You forgot that I indicated that I am a deist which you kindly tried to define for me, quite badly, BTW." @Chad "I used the dictionary definition.. what definition do you use? @Clarity "So when you say "atheists that reject the possibility of the existence of God", hopefully you realize that you're not speaking about the "broad"-sense category of atheists"
@Chad "that's why I specifically said "I dont say that all atheists ascribe to the multi-verse, nor that they all reject outright the possibility of God." Based on the large number of hours he is here, as well as his various stylistic and linguistic choices, my best guess is that Chad is about 16, home schooled, and a bit desperate in his desire to be recognized as intelligent. His very poor sourcing for his information reveals him to have no higher education, where such sources would devastate his grades. His techniques of argumentation reveal he has never had been subjected to expert review, not even at the level of a college professor reviewing a paper, though he has felt frustrations at the dismissal of his work from lower level reviewers and compensates here. I would also note that the extreme amount of time Chad spends here reveals he is nearly friendless and lonely, again compensating here in a rather bitter manner. "The multiverse comes with a lot of baggage, such as an overarching space and time to host all those bangs, a universe-generating mechanism to trigger them, physical fields to populate the universes with material stuff, and a selection of forces to make things happen. Cosmologists embrace these features by envisaging sweeping "meta-laws" that pervade the multiverse and spawn specific bylaws on a universe-by-universe basis. The meta-laws themselves remain unexplained – eternal, immutable transcendent ent ities that just happen to exist and must simply be accepted as given. In that respect the meta-laws have a similar status to an unexplained transcendent god." Davies concludes "there is no compelling need for a supernatural being or prime mover to start the universe off. But when it comes to the laws that explain the big bang, we are in murkier waters." The real question regarding fine tuning is "how did the stupidity of so many people get so precisely fine-tuned to believe in obviously untrue imaginary superfriends?" " But when it comes to the laws that explain the big bang, we are in murkier waters." "
And murkier waters still do not open the pool of possibilities to the God of Israel or any other. Aw, you caught me, cherry picking what I wanted out of a source, mea culpa, but I learned from the best YOU. Chad [ "I view those as essentially equivalent statements. so if I consider something even a remote possibility, I embrace it?? Very interesting . .
Oh, gee, another day in which Chard has failed to produce any evidence whatsoever that a god exists or that one was required for the universe's inception. I think the Chad is pondering my modern definition of deism and is in a quandary on how to answer, just kidding. Hopefully Chad is pondering the futility of a life spent defending the immoral behavior of his imaginary friend. Chad's efforts to justify his belief in his God of Israel is akin to his efforts to blow up his inflatable mistress. Way too much effort just to feel loved. Love is all you need. Right Chad? in time – It's easy. Concerning this same Hawking book cosmologist Dr. Lawrence Krauss also commented that "there are remarkable, testable arguments that provide firmer empirical evidence of the possibility that our universe arose from nothing. ... If our universe arose spontaneously from nothing at all, one might predict that its total energy should be zero. And when we measure the total energy of the universe, which could have been anything, the answer turns out to be the only one consistent with this possibility. Coincidence? Maybe. But data like this coming in from our revolutionary new tools promise to turn much of what is now metaphysics into physics. Whether God survives is anyone's guess." I'm starting to think that you are avoiding my questions. If a powerful being shows up and claims to be God do you trust him, or does he have to provide proof? Would it be impossible for any other being to convince most people that he's God? Could you scientifically determine if he were what he says he is? Should read "Conclusion: atheists that embrace the notion of a multi-verse have no possible basis for rejecting the possible existence of the God of Israel, or the gods of Greece, India, China, Africa, Polynesia, the Celts, the Maya, the Aztecs, the American Indians, The Inuit, and on, and on... All of these gods and goddesses are equally likely as the God of Israel. You're just playing favorites, which isn't very logical.